After I published the original post on the Streeter brothers I was contacted by their relative Christine Johnson, and she supplied photos from the family album, with permission to use them. It’s taken a while for me to have chance to research further around them, but here they are. A memorial card created by the family, these would have been distributed around the family and friends. William Streeter jr pictured with his wife, Susannah “Nessie” Leaven, presumably on their wedding day, 26 April 1919. With confirmation that he married, I was able to track down the marriage certificate. 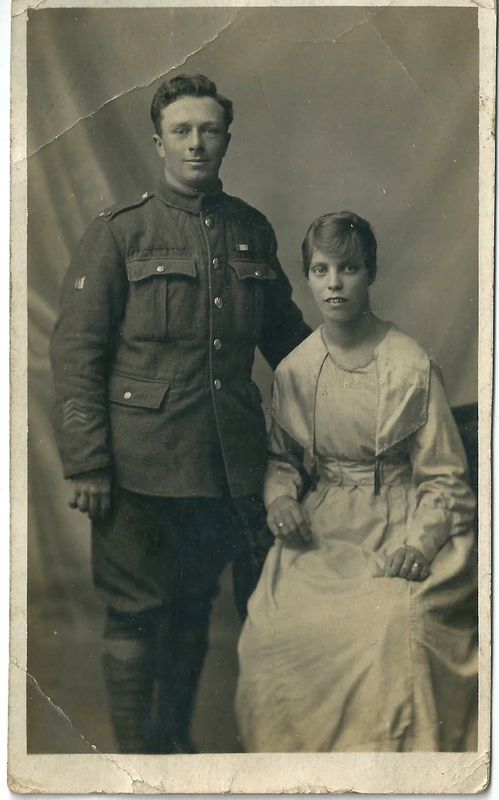 William Streeter (26, a soldier) and Susannah Leaven (22) on 26 Apr 1919 at Holy Trinity, Finchley. Fathers’ names William Streeter (recorded as a farmer, whether this was a misunderstanding by the vicar, or a deliberate attempt to “sanitise” the fact it was a sewage farm isn’t clear) and Abdy Leaven. The address for both is given as 9 Prospect Place. The second marriage recorded on the same page of Arthur Edgar Hill (20, a soldier) and Ellen Louisa Connor (20) who also both give their residence as 9 Prospect Place, one of their witnesses is Rhoda Streeter, sister of William, while one of William and Susannah’s witnesses is Dorothy Grace Hill, presumably a sister of Arthur. They had a son, Kenneth W, on 15 February 1927 in the Barnet registration district, and a daughter Binnie J, in Halstead, Essex, in 1933. By 1939 the family were living at Mount Pleasant, Stoke Goldington, Newport Pagnell. William’s death was registered in Northampton in the first quarter of 1967. William Streeter sr in army uniform. 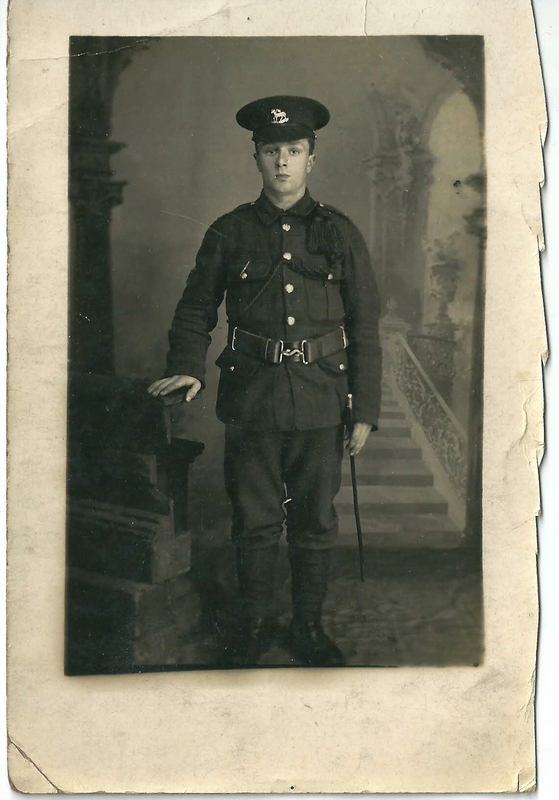 The cap badge appears to be that of the Royal Engineers. 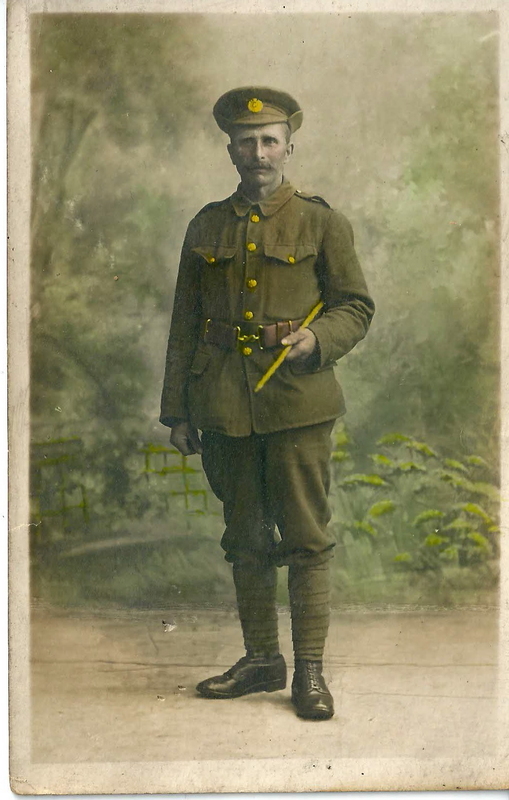 The photo has been partly hand-coloured, largely to bring out the colour of the brass of the buttons, badge and belt buckle, and also some of the background. I’ve not been able to find a matching profile on Lives of the First World War: given his age it seems likely that he would only have served in the UK, so he would not have been eligible for campaign medals, and so would not have profile. This does though raise the possibility that it was actually William sr who is listed on the roll of honour, not William jr, although the unit is stated as Queen’s, not Royal Engineers. 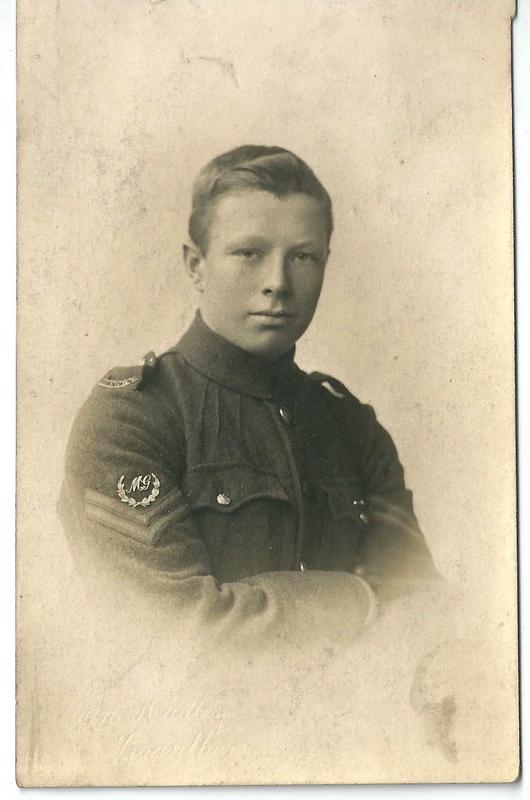 I never could find any evidence of William jr ringing in Surrey, and we can now see that he had moved away from the area straight after the war. 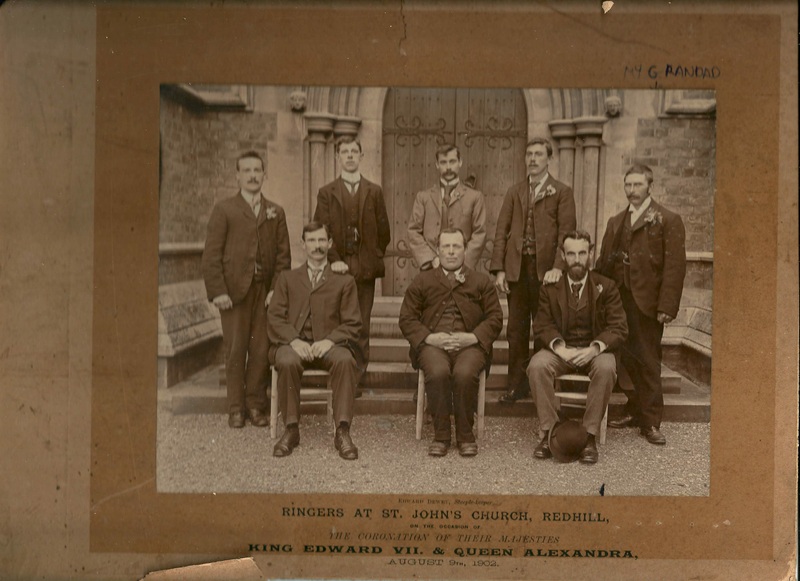 The ringers at St John’s, Redhill, when they rang to mark the Coronation of King Edward VII and Queen Alexandra on 9 August 1902. Edward Dewey is named as steeplekeeper, and is probably the man seated in the middle of the front row. 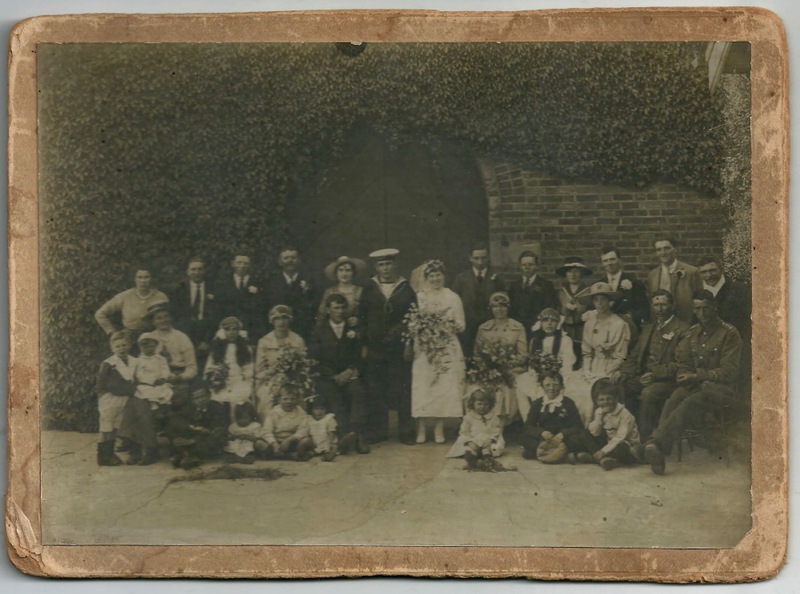 The man at the right of the back row marked “My grandad” is William Streeter (father of the Streeter brothers). 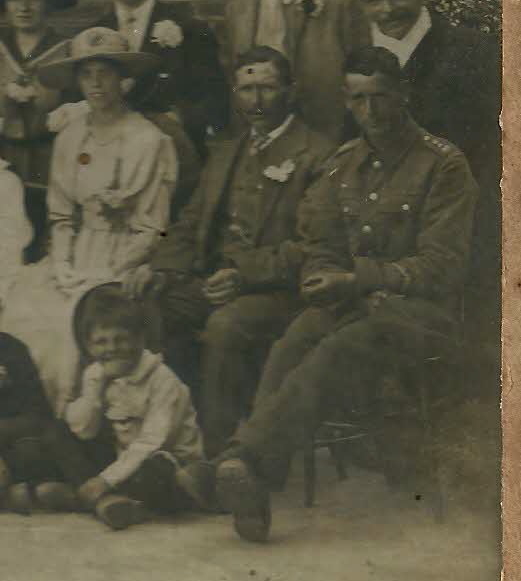 In the bottom right is a man in army uniform, cropping this section out for a closer view, it seems evident that this is William jr, with his father (William sr) to his immediate right, and then his wife Nessie. William jr’s shoulder titles now seem to be the later form of fusilier shoulder titles, with the flaming grenade now separated from the letters representing the regimental title. THE LATE MR W STREETER.-The funeral took place on Wednesday of Mr William Streeter, who passed away, following upon a fall, at 9 Park-lane, Coulsdon, the home of his son, on December 31st, at the age of 71. Mr Streeter was for many years in the employ of the Reigate Town Council at the Corporation Farm. He was conscientious in the discharge of his duties, and was much respected. He was also a member of St John’s Church bellringers for many years. His wife predeceased him in 1935. The funeral service was held at Reigate Parish Church, the Vicar (the Rev R Talbot) officiating, and the internment was in the family grave in Reigate Cemetery. The mourners were: – Mr W Streeter (son), Mr and Mrs R T Streeter (son and daughter-in-law), Mr and Mrs G Chandler [sic] (son-in-law and daughter), Messrs G and S Streeter (sons), and Mr and Mrs R L Taylor (son-in-law and daughter). There were a number of beautiful flowers. The 1939 Register shows that William sr was living with the Chandlers at 1 Holmside Cottage, Dorking Urban District, Surrey, England when the register was compiled on 29 September. 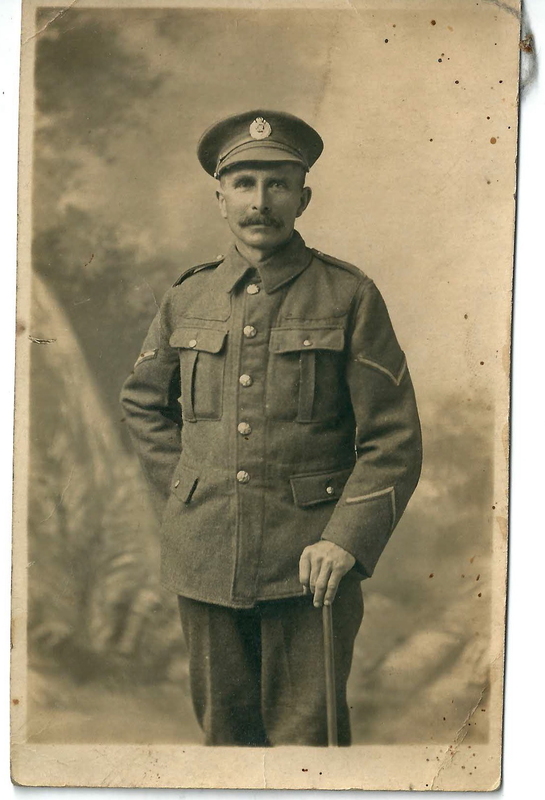 To bring the First World War service of the family together, I’ve created an additional community in Lives of the First World War for the member’s of the family who served. Hopefully I’ll be able to create a profile for William sr at some point. This entry was posted in Redhill, Reigate and tagged Albert Streeter, William Streeter on 12/04/2017 by davidunderdown95.